This is a great time to be a woman entrepreneur in Africa, as we enter the second half of what has been officially designated as The Decade of the Woman Entrepreneur in Africa. The African continent leads the world in female entrepreneurship, with 50% of all enterprises being women owned, according to the World Bank, and 25% of Africa’s women have set up their own businesses from scratch-that’s the highest rate on the planet! Uganda, for example, has the highest per capita rate of women’s entrepreneurship anywhere in the world. And, this trend is set to rise on the back of a new-found confidence amongst women in Africa. It’s clear that women’s entrepreneurship in Africa has reached a tipping point and can certainly no longer be seen as a passing fad, raising the odd eyebrow and resulting in the occasional eye-catching newspaper headline. It’s a fundamental economic force that will reshape the economies of not just Africa, but indeed the world. As a result, this is a market worthy of attention by global financiers and local policy makers alike. The nations in Africa that stand to gain the most from this trend are those that are building supportive structures and entrepreneurship ecosystems that allow for women to progress from survivalist entrepreneurship to opportunity entrepreneurship, and to fulfil their real potential. Progressive countries are understanding the economic potential of allowing women to move from micro to high growth-from supporting life to creating wealth, and are providing the support mechanisms at a practical level to help them on that growth journey. Yet interestingly, women’s entrepreneurship still lags behind their male counterparts in all but seven countries in the world. The fact is, if women’s labor participation were closer to that of men, it would contribute a trillion dollars to GDP in emerging economies. Women led businesses are key to this opportunity. On the flip side, what is really interesting about this trend is that women are increasingly seeing entrepreneurship as a compelling alternative to the corporate world-particularly millennials. They see that entrepreneurial activity creates real growth and prosperity-and importantly, solutions to address lingering social problems. And today’s trends show that women will be a driving force of entrepreneurial growth in the future. Lionesses of Africa is one organisation dedicated to raising the profile and conversation around women’s entrepreneurship in Africa, sharing the inspirational stories of those women entrepreneurs who have achieved stellar success, and inspiring and connecting those who follow in their footsteps. Lionesses of Africa is the digital home for Africa’s women entrepreneurs, an online community to support, celebrate and raise the profile of women entrepreneurs across the continent. As a social enterprise, the ethos behind Lionesses of Africa is based on Sharing, Inspiring and Connecting and all resources for women entrepreneurs are free. We enable women entrepreneurs to share their startup stories, their knowledge and experiences; inspiring one another to reach greater heights; and connecting with one another for accelerated business success. Lionesses of Africa also provides a platform where today's successful women entrepreneurs from across the African continent get the chance to send the elevator down to the next generation of young women who will follow in their footsteps. We're a community which welcomes young women entrepreneurs of tomorrow who are looking for advice, insight, and a platform where they can promote and share their own business ideas, whilst at the same time seeing how those women who are at the pinnacle of their entrepreneurial journeys have achieved success. 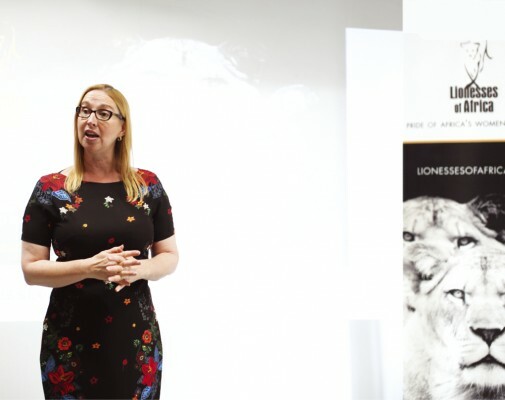 The name ‘Lionesses of Africa’ was inspired by the realisation that, just as for lionesses in the prides that live and hunt on the plains of Africa, life is challenging for many women entrepreneurs in this part of the world. The iconic image of the strong Lioness is a perfect symbol for these inspirational women who are building great businesses, often against all the odds, and contributing both to economic growth and community upliftment. Just like the lionesses on the plains of Africa instinctively know they need to work as a pride in order to hunt and survive, women entrepreneurs are realising they can achieve so much more working together and collaborating. Also, lionesses, both of the feline and human kind, know that to progress they need to nurture the next generation who will follow in their footsteps. The initial development process for Lionesses of Africa started with months of meetings, conversations and interviews with women entrepreneurs from across the African continent, to hear about their very personal entrepreneurial journeys and the challenges they faced along the way. The development of the Lionesses of Africa community and all its online platforms and publishing projects, is based on connecting with people and audiences through the tradition of storytelling. So in the early stages, the focus was on meeting and connecting with as many women entrepreneurs in Africa as possible—to write and share their stories, to profile their companies and the work they do, and to connect them with a wider network of like-minded women. This was, and still is today, the most enjoyable part of growing the Lionesses of Africa community. 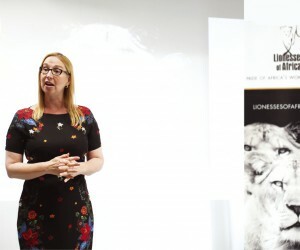 The recent launch in January 2016 of the Lioness Lean In event series, supports the idea of bringing women entrepreneurs together on a monthly basis around the continent to share their stories, inspire one another and connect for greater business success. Every day, we meet the most inspirational women entrepreneurs from across the African continent, and indeed around the world, all of whom are creating incredible businesses, building innovative new brands, and positively impacting on their sectors and communities. Women are naturally good communicators and understand the power of sharing when it is for the greater good, and therefore we have been continually impressed by these women telling their stories and relaying their experiences, in the hope that it can inspire and guide others just like them. Simultaneously, the online platforms were created in order to build a genuinely powerful and highly effective online community. The Lionesses of Africa website itself was developed over a one year period, together with all the accompanying social media platforms. The approach with our platforms is to always create the most engaging, interactive and embracing online community and tools that help us to fulfil our mission-to Share, Inspire and Connect. The reception to Lionesses of Africa has been phenomenal and the feedback so positive—in fact today, there are over 100 000 women entrepreneurs who are part of the Lionesses of Africa network across the continent and the Diaspora. The organisation is well on track to reaching its mission of supporting 1 million women entrepreneurs in Africa by 2018. I passionately believe that Africa needs more successful women entrepreneurs, and Africa’s women entrepreneurs need all of us. It is time to provide the support, tools and inspiration to ensure that the next generation of women-led businesses on the continent can flourish. There is no doubt that entrepreneurship can have a powerful impact on the future growth of economies around the world, and in Africa in particular. One of the most exciting developments is the increasing role of women entrepreneurs as the drivers of this new entrepreneurial spirit. At a time when many countries in Africa are facing significant economic challenges, perhaps the answer could lie in more women being inspired and encouraged to start and build entrepreneurial ventures of their own. By doing so, they not only create a source of sustainable income for themselves and their families, but also build viable businesses that have the potential to grow, to create much needed employment opportunities for others, and to innovate in key sectors where a new way of thinking is needed. So, perhaps there has never been a better time for the women entrepreneurs of Africa to shine and genuinely drive the future direction of the continent’s economic growth and prosperity.